Some of us have probably heard this as far back as from grade school, that whatever you choose to do in life, do it to the best of your ability and do it well. We have even heard - do what you love and love what you do. You see, therein lies your happiness in life. 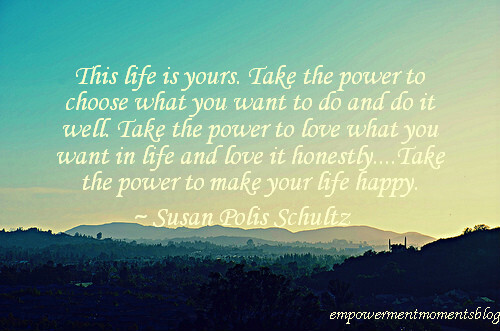 You have the power to choose to make your life as happy or as miserable as you want it to be. In life, you cannot buy your way to happiness. You cannot depend on friends or family as your source of happiness. Because, truth be told, that would be like living life on the edge of a roller coaster - one minute you will be up and the next minute you will be down. And the minute you are down, that's when everything around you falls apart and you are without a clue of how to put the pieces back together. This life is yours! Take charge of it! You have the power to give it meaning, primarily by your thoughts and then your outward actions to make your time worthwhile here on this earth, and to be the instruments of love and hope as God has purposed for you. What are your thoughts on this? What would you add or say different in this post? Let's hear your thoughts and be a blessing to someone else today. Like, follow and share our page on facebook We now have a presence of Pinterest as well where you can follow or re-pin from our boards. Thanks for being a part of EMB! You are God's best - you are fearfully and wonderfully made.